Everton and Turkey international striker Cenk Tosun has vowed to stay at Goodison Park and fight for his place in the first-team. 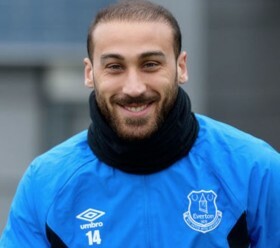 The Toffees' recent good form has left Tosun out on the sidelines with the former Besiktas striker rumoured to be ready to return to his homeland in the January transfer window. With Gylfi Sigurdsson, Richarlison and Theo Walcott preferred by manager Marco Silva, Tosun has often found himself on the bench and left in the cold in most games, unable to make an impact from the sidelines. Tosun had been linked with a transfer move back to Turkey this January, but in new comments given to the press it appears as if the striker is now ready to stay put in England for the time being. Tosun quipped: "I will fight more to get back the jersey. I will not go anywhere. Tosun has three years remaining on his contract with the Blues and is valued at around 14 million euros by the club.